The City of London is perceived as having its own, mostly male, culture of competition, money making and values around financial success. This work was made within the City and takes these elements as its starting point. It asks the viewer to consider to what extent these assumptions affect the people who work there and their relationships with their colleagues and how much a change in perceptions around identity and behaviour might impact on people. The three panels are each set within a notional time line, beginning with: ‘A fresh start to the working day’ and moving on into the day and further into the structures of life in the City of London. Below this are four photographs of men in pairs, walking in the City, that have been taken as stills from 8 mill films that Willats made of city workers. 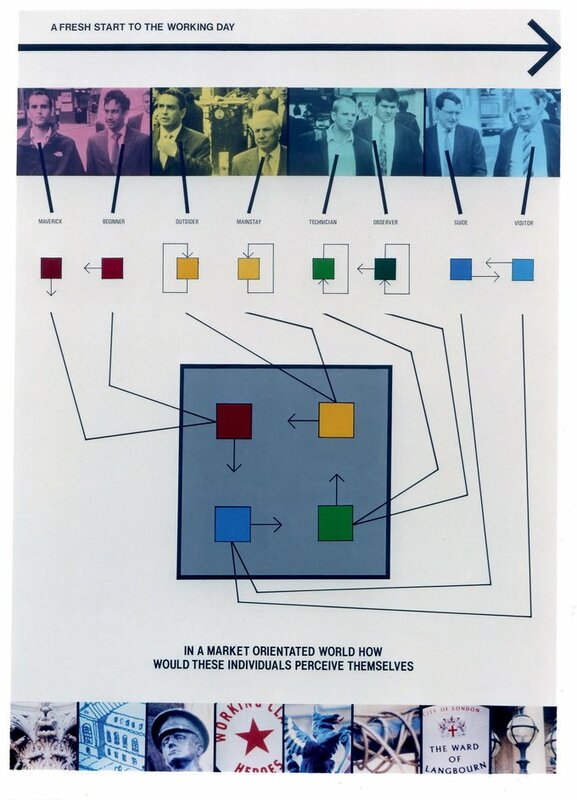 Each of the men is described – as a maverick, a guide, an idealist, a negotiator and so on becoming more co-operative in nature in the third panel – leading the viewer also to look and see whether they agree with the description and to consider how we make assumptions about people from a brief observation. 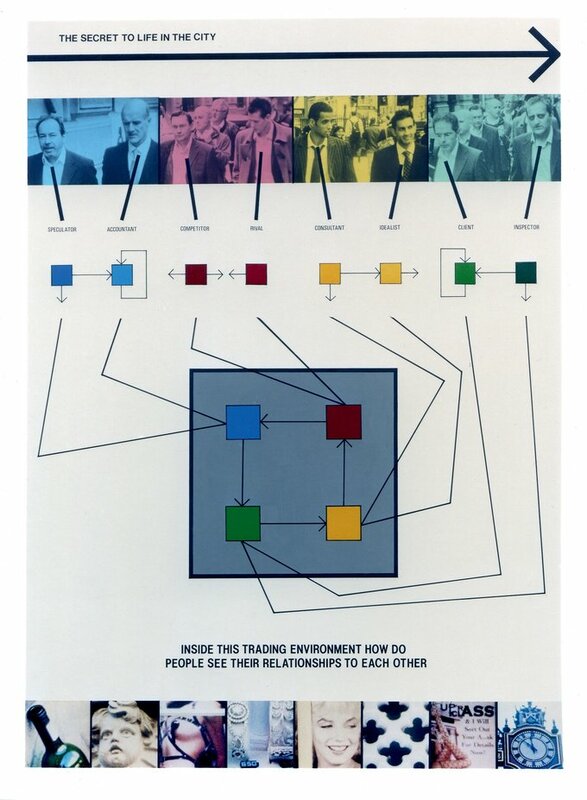 Below each of the pairs are diagrams that gradually increase the level of contact and suggest the nature of the relationship between the two men in the photo and these are linked in to a larger diagram of relationships. Below this is a question the viewer is invited to consider and finally there is a series of photos of signs and symbols from the City that provide a series of attendant images of historic or current symbolism within the context of this financial centre. In each panel there is a gradual change in the nature of the relationships seen in the diagrams, so that, as the arrows representing the channels between people increase the perceptions of identity and behaviour are correspondingly seen to develop. The arrows representing the nature of the relationships in the first panel are disconnected and the question concerns how people see themselves, the arrows are more linked in the second panel with a question to the viewer asking about relationships one to another and in the third panel the arrows represent a homeostat where all the elements are fully connected one to another and the question is about the creation of a society within this trading environment. 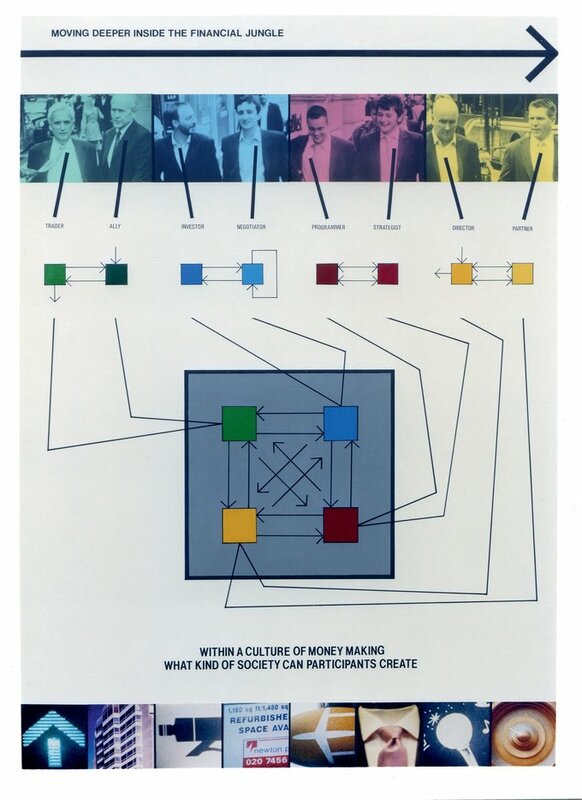 The questions draw the viewer in to making connections between the images, diagrams and texts, the variables and the encodings inside each panel.